Many users of the popular BitTorrent client uTorrent are complaining about it silently installing a cryptocurrency miner with a recent update. The Epic Scale tool, which slows down host computers, is reportedly being installed without consent and for some is particularly hard to remove. The application brings in revenue through in-app advertising and also presents users with “offers” to try out third-party software when installed or updated. These offers are usually not placed on users’ machines without consent, but this week many users began complaining about a “rogue” offer being silently installed. The complaints mention the Epic Scale tool, a piece of software that generates revenue through cryptocurrency mining. To do so, it uses the host computer’s CPU cycles. Epic Scale was flagged by many anti-virus vendors (update: not anymore). However, it has been included with uTorrent for several weeks already, without any significant complaints. However, starting this week many users reported that the software was installed without any notification. “This is pure bloatware, just updated my uTorrent. There was no notification about the software it just installed,” Aiziag complains. “Got this installed quietly when upgraded U-Torrent. When I arrived home this evening my PC was running at full tilt and practically blowing steam. I felt like it was going to catch fire,” Daniel adds. The issue was also brought up at the uTorrent forums, but the initial thread was deleted by a moderator. Meanwhile, many more complaints started pouring in, mostly on the freefixer website. “Just updated uTorrent and it didn’t tell me anything about that total f*cked up ‘Epic Scale’ trash, which constantly keeps popping up with ‘Could not connect to server’,” Simon writes. “Noticed the laptop was ‘laggy’ and then I saw the mysterious E in the taskbar. Blamed the kids again but then I saw the Utorrent update comments and bingo, me too,” Ian notes. The sudden increase in complaints over the past two days suggests that something went wrong with the install and update process. 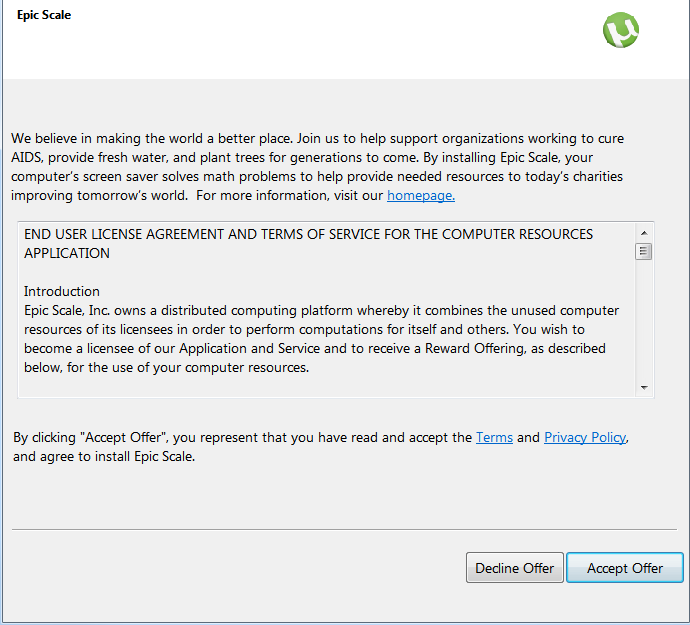 Several users specifically say that they were vigilant, but instead of a popup asking for permission the Epic Scale offer was added silently. “When I updated uTorrent today, an offer to install Baidu Av just popped up. I declined. I wasn’t told nothing about Epic Scale! I was alert, this software was simply installed quietly, without even a single checkbox. I wasn’t given a chance to decline,” Marcos writes. The Epic Scale team says that it’s investigating the issue. Despite being grilled by an angry mob, they’re offering assistance and a $20 Amazon gift card to affected users who provide additional details. “I recognize many of you are reporting a silent install. We are going to address this with all our distribution partners and determine what’s going on,” Epic Scale’s Alexander writes. TF reached out to uTorrent’s parent company BitTorrent for further details but they have yet to reply. However, in a new forum post a customer support manager denies that there are any issues. Given the unusual surge of reports about silent installs, however, it might be that something went wrong, at least for some. Update: The silent install appears to happen selectively, and not on all machines. BitTorrent is known to vary its offers based on user location and other variables. TF had confirmation from various sides and with screenshots of every step of the install process where the software was reportedly installed even though no Epic Scale screen appeared. In one case, the opt-out screen was eventually shown after several re-installs. Update: BitTorrent Inc. informs TF that they are not aware of any problems.